There are many ways to MAKE THE MVJF YOUR FEDERATION! IDEAS - We welcome your ideas, insight and imagination as our goal is to provide more activities that you, your family and friends desire. INITIATIVE - We invite you to volunteer your time and expertise to help create and implement new programs and to assist with successful, on-going activities. INVESTMENT - You can choose to support programs and initiatives that are of interest, express your values, and achieve your desired connection to community and Jewish life. MAKE THE MVJF YOURS. Add your personal touch. Build and Sustain relevant and compelling activities. Foster caring for people in need. Act now., and while we respond to your new ideas, we hope that you might consider helping to grow one or more of the successful initiatives currently underway - SPOTLIGHT on Jewish and Israeli Culture and/or the PJ Library Program. 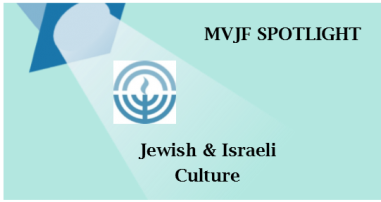 SPOTLIGHT offers a full array of programs that display the richness of culture as a means of exploring our history and expressing modern day Jewish life, as well as social events with fun as the goal. The 2018 line up included two Adult Ed. series on Jewish Music and Jewish Art, a movie premiere featuring the late Sammy Davis Jr., a tribute to Broadway’s Jewish Songwriters with a Jazz vocalist/pianist, a speaker on “Jewish Culture’s Role in building Jewish Community,” and the creation of a new Jewish Film Club. Plans for 2019 include: March 10 “Show Me the Monkey - Family Film and Fun” featuring Curious George, for ages 2 – 8 and their parents; April 6 “Tequila and Trivia” our annual night of Sips, Tips and Quips; and an expanded multi-day Film Festival starting May 18 with a Gala opening. In addition, we’re working on an evening of acapella music, a one day Feast of Jewish Learning, a Genealogy Club, Family Day at Camp Hadar, Challah baking lesson, Israel program...and your suggestion. MAKE SPOTLIGHT YOURS! PJ Library is a Jewish engagement and literacy program for Jewish and interfaith families with young children. (Over 25% of parents say they are intermarried.) Each month children, starting at age 6 months, receive free books along with a guide to help parents discuss the theme of the book with their children. (91% of parents believe PJ Library is a valuable parenting tool.) A key feature of “PJ” is the opportunity to get together with other families for fun and learning. “More than 80% of parents say PJ Library gives them more confidence to engage with their children regarding Jewish values, culture, and traditions.” Ten years ago, thanks to the generosity of 8 donors, 180 children were in our PJ program. Overtime, with less funding, we’ve have had to reduce the number of participants and today we have a waiting list. MAKE PJ LIBRARY YOURS!